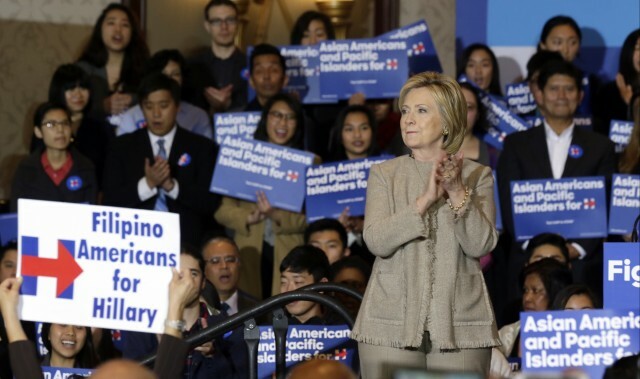 Democratic presidential candidate Hillary Clinton is welcomed by Asian American and Pacific Islander supporters in San Gabriel, California, on Thursday, January 7, 2016. Below is an adapted excerpt from Immigrants and Electoral Politics: Nonprofit Organizing in a Time of Change, by Heath Brown, to be published by Cornell University Press on November 8, 2016. Seated in a circle with Chinese-speaking volunteers, Julia Chung, the civic engagement associate from the MinKwon Center for Community Action, trains the group in the art and science of phone-banking. In part because they are less likely to vote, Asian Americans, especially those with limited English-language abilities, have been ignored in city and state politics. Chung knows that to overcome this problem, MinKwon must better understand the community’s problems. She urges the volunteers to not take no for an answer and reassures them to not get discouraged when they get rejected by a voter. After the group does some practicing, taking turns pretending to be a voter on the other end of the conversation, it’s time to make the calls. There are no extra phones for the volunteers to use, no elaborate call center on site, so Chung directs them to take their seats at the desks of CPC’s employees who have gone home for the day. When the voters begin answering the calls, Chung sees her volunteers light up. “A lot of the phone-banking is done by our youth, so we have a student that is super shy—a wall flower—then we see them pick up the phone and talk to voters in Korean or Chinese, they are so comfortable, so comfortable that we are amazed,” Chung says. MinKwon is one of dozens of nonprofit groups nationwide toiling to turn out immigrant voters in 2016. Such groups have stepped up their activities in this election, which has been marked by anti-immigrant attacks, and which may hinge on turnout from Latino, Asian American, and other immigrant groups. Though nonprofits rarely have deep pockets, lack strong ties to political parties, and are barred by tax laws from engaging in partisan political activity, they nevertheless have many electoral tools at their disposal. Though nonprofits rarely have deep pockets, lack strong ties to political parties, and are barred by tax laws from engaging in partisan political activity, they nevertheless have many electoral tools at their disposal.Nonprofit organizers may register voters, sending volunteers to community events and cultural celebrations. They may inform immigrant voters about the hours and locations of polling places, and translate voting information it into different languages. They may mobilize voters via door knocking and phone calls, again deploying volunteers who can speak to immigrants in their native languages. In Chicago, a group called Alliance of Filipinos for Immigrant Rights and Empowerment, or AFIRE, discovered that Filipino Americans were well represented in the community but not among elected officials. In response, AFIRE launched a new electoral project called “Rock the Balut”—a play on a term that describes the Filipino tradition of boiling and eating a fertilized duck or chicken embryo in its shell—to register and turn out Filipino-Americans voters during the 2012 election. In Virginia, the Virginia Caribbean-American Cultural Association (VCACA) has overcome its small budget by collaborating with other groups on an annual CaribFest, which features voter registration activities run in part by student groups at Norfolk State University. In Georgia, the Asian American Legal Advocacy Center (AALAC) rented a highway billboard with the slogan “Nov. 6—Vote for Our Future—It’s Up to You” that featured photographs of four local children. The billboard space didn’t come cheap, but AALAC organizers saw it as the most visible way to convince Asian American voters, who make up an ever-growing share of the state’s population, that their votes would make a big difference. In Gwinnett County alone, Asian Americans now make up 11 percent of the population. These examples illustrate both the growth of immigrant centers beyond major cities like New York and Chicago into cities across the South, and organizers’ willingness to go beyond conventional activities such as neighborhood canvassing and to try new high-technology tools, social media, and billboard advertising. Back at the MinKwong Center in New York, organizers say it’s the enthusiasm of community volunteers, sophisticated technology, and resources from a national philanthropic foundation that keep them going. Money from grants allows the small organization to pay for access to Catalyst/VAN, a voter information database, which then enables the volunteers to target phone calls to Chinese-speaking residents and later go door-to-door mobilizing for last-minute voter turnout. For a nonprofit organization with a limited budget, assistance from the community and foundations are what permit the group to play a significant role in electoral politics. And the various tactics work. MinKwon does not endorse any candidates. But in 2012, the group registered 60,000 voters in New York City. And that year, Queens elected its first Asian American woman member of Congress. To be sure, not every electoral campaign results in a new face in the legislature, as it did in Queens. But more voter participation will move immigrants away from the periphery and into the mainstream of local and national politics. Turning out immigrant voters can be time-consuming and costly. Volunteers are hard to find, and election rules may vary from one region to the next. Nonetheless, as New York City Mayor Ed Koch famously said during the 1980s: “You don’t vote, you don’t count.” Candidates, political parties and their allied PACs are all busy trying to mobilize immigrant voters. But it’s nonprofit organizations like MinKwon that may hold the key to whether immigrants actually turn out and vote this year.